Two kinda stranger stories from Mexico. 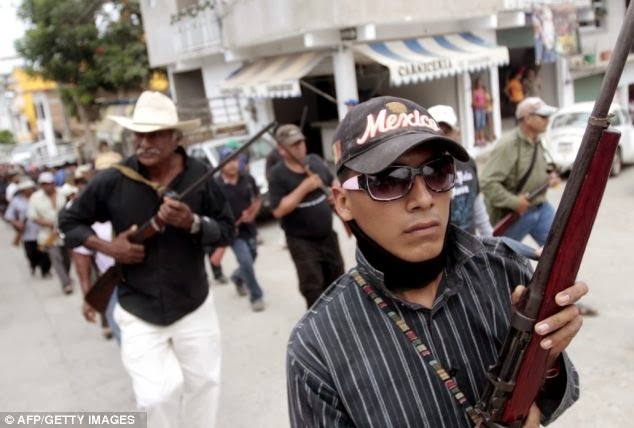 First there's the group of armed vigilantes seize a town outside Acapulco and arrest local police officers after the leader of the vigilante group was murdered and dumped in the street. It sounds like a complete mess.I can understand the local concerns. 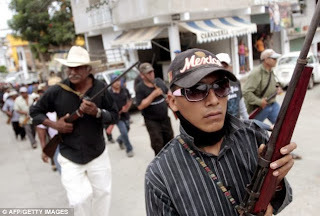 Mexico is in chaos right now with the brutal violence related to the drug cartels fighting each other. The same cartels that the US government supplied in Operation Fast and Furious and the HSBC were laundering drug money for. Equally absurd is the fact that heavily armed marines and government tax agents stormed eight marinas on Mexico's Pacific and Caribbean coasts and initiated seizure orders against 338 boats it accused of lacking a $70 permit. The office says it has four months to decide whether to release the boards or sell them at auction. These weren't boats that had drugs on them, they were tourists who didn't have some crazy permit. You can't get any more corrupt then that. I guess when you look at the rest of the world things here don't seem so bad after all. C'mon, even the Mexican authorities are admitting an overreaction regarding the boat issue. BUT, could you imagine what would happen to a foreign national trying to bring a car or boat into Canada or the USA without the correct documentation? I'll bet my left nut they would be treated MUCH worse than how the Mexicans treated those Canadian or American boat owners. Mexican authorities aren't seizing Mexican citizens cars on the spot when accused of doing 40kph over or having a couple beers. Lets focus on our own out of control fascist government before we start pointing at others. Something to think about. Newton Crime: Are Judges the Problem? The Red Scorpions: Who's left?